Back in December 2014, I wrote a post about an old photo I’d found in my late father-in-law’s little timber briefcase of photographic treasures. It was an image of a naval vessel with a partially-built Sydney Harbour Bridge in the background. On the back of the photo, someone (whom I have always assumed to have been the FiL, but it may just as easily have been the MiL) had written ‘HMAS Sydney, 1938’. As the Coathanger was opened in 1932, we knew the date was wrong and figured it was probably meant to be 1928, not ’38. But it never occurred to me that the ship (boat? vessel?) in the photo wasn’t the Sydney. I had done a little research at the time of writing the original post as the FiL’s brother-in-law, Bernie Biram, had been on HMAS Sydney II when it went down off the West Australian coast in November, 1941. 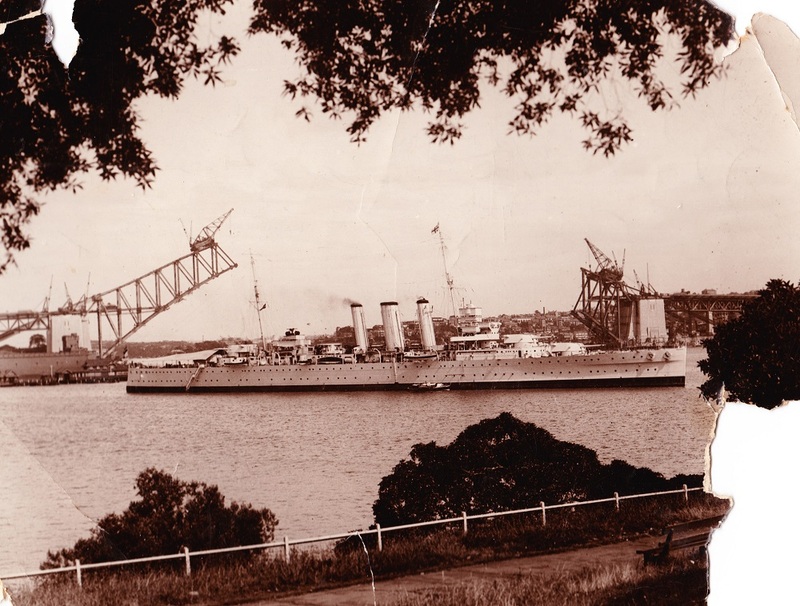 For various reasons, I figured the vessel in the photo was probably HMAS Sydney I. Which HMAS Sydney is it? No. I or No. II? My money is on No. I. Well, it turns out I’m wrong – on both counts! (Yes, you read it first here, folks – a woman admitting she was wrong.) Not only is not Sydney I or II, it’s not even an HMAS Sydney! I had an email from a lovely gentleman a few weeks ago who pointed out that it wasn’t a Sydney, that it didn’t look like one, and while I doubted he was correct, I had to prove him wrong (naturally!). And so the hunt began. After discovering the wonderfully helpful http://www.navy.gov.au site, I was able to narrow it down to one of the Australias, and I’m pretty convinced it was Australia II. If you compare the original photo with the image below courtesy of the Australian Navy’s page here: http://www.navy.gov.au/hmas-australia-ii you can see the similarities in funnels, portholes, degrees off perpendicular which the bow and stern have been set, etc. The story of HMAS Australia II seems to fit with the photo we have on hand, so I’m hoping that we have now solved the history mystery!